Sakara is unique and original with Japanese decor, private restroom, bath, laundry machine, kitchenette, and high quality western queen sized beds. Free wireless internet signal, local TV, and local phone line standard. Sakara has a common tatami room next to the lobby overlooking a Zen garden. The first floor tatami lounge has complimentary coffee and green tea for guests. We want you to get the most out of your trip to Kyoto. 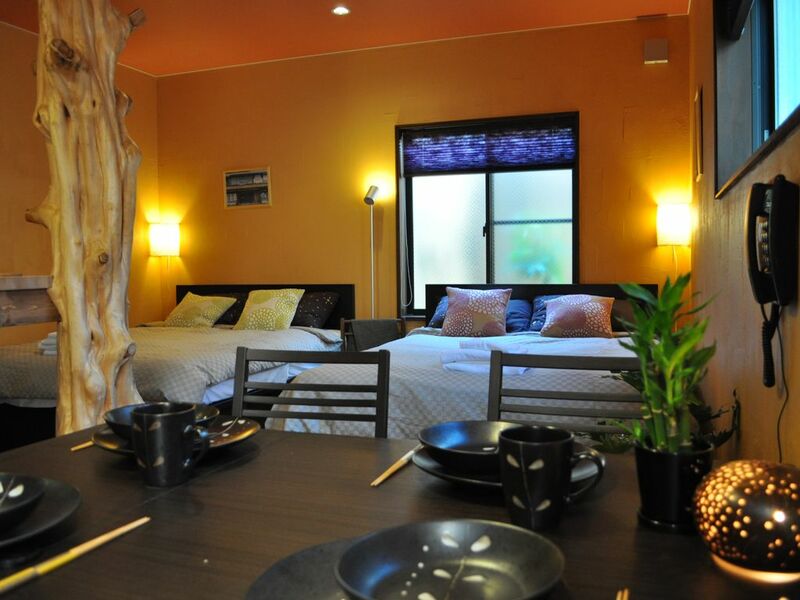 With that in mind we have designed this accommodation especially for the foreign traveler in Kyoto. Traditional styling is important to us, so we have incorporated the Japanese elements we love with an eye to Western comfort. You will enjoy the feel of a classic historical machiya building; natural wood, plaster, paper, and tatami highlighted with Japanese art and furniture. The Best of Both Worlds: : *** Sakara offers you the convenience of a hotel or Ryokan with the privacy of a house rental. The kitchen allows you to cook as you like. You can do laundry and take a hot bath. *** Japanese feel and decor are complimented with highest quality bedding, High ceilings and doorways, and personal touches. Art and antiques blend the modern with the traditional. *** Sakara is walking distance from the Gion district, shops, and subway. There are many nearby cafes and restaurants. Sakara is great for families. If you have a larger group please contact us for information about other options as well. *** The Bamboo Suite is ideal for a family or group of four guests. *** Please contact us directly about discounts for longer stays or options for larger groups. We have been renovating - and living in - traditional Kyoto buildings for over 18 years. Mike first came to Japan in 1997 for a working holiday, and fell in love with the city, while Yuko originally comes from Osaka. We want to share our city with you. We designed and built Sakara in 2009, when holiday rentals were not yet so popular in Kyoto. During this ten year period we have seen eastern Kyoto explode in popularity, and we know why! The area around Higashiyama is the best place to use as a home base while you explore the historic town of Kyoto. Stay with us and you get the added benefit of being able to ask bilingual Kyoto residents questions that you need answered. The Bamboo Suite has a spacious modern Japanese shower and bath area. Toilet / laundry areas are in a separate space. Free local calls, ability to contact us for 24 hour concierge service. electric heating for safety and comfort. For stays of a week or longer we arrange a full housekeeping service, otherwise linens are not changed daily. All-in-one washer/dryer - - please see note about drying. There is a 24 hour laundromat nearby that has air-dryers. The 'all in one' Japanese laundry machine has a dry setting but it takes a long time and does not dry clothes completely with heat. Fastest internet available in Japan! For stays of a week or longer we arrange a full housekeeping service, otherwise towels are not changed daily. Strong WiFi signal throughout the building. Refrigerator/freezer for keeping drinks and other items. Freezer has ice trays as well. Kitchenette has everything you would expect. IH induction range, cutlery, pots, pans, etc. • Sakara is a strictly non-smoking establishment. • Bilingual English/Japanese staff available for assistance during business hours. • We used the highest quality all natural and non-toxic plaster, stains, paint, washi paper, bamboo, stone, and other finishing products to ensure a healthy environment. Sakara is a wood building with the spirit and resonance of natural materials. Fantastic location. Clean, cute place with responsive host. I would highly recommend this to anyone visiting Kyoto. What a lovely place! It was perfect and everything we needed. I was only in Kyoto for three days but the Sakara suite is where I will stay next time I come to town. I loved it. The location is perfect as there’s a little market street right outside and we are walking distance from so many things. The room was spacious and heated, and was easy for our constantly on-the-go vacation. I slept well as the beds were soft and comfortable! Easy 5 stars! We loved our stay here! It was conveniently located and pretty spacious for three people. There were plenty of amenities like a kitchen and washing machine and the beds were very comfortable. Definitely recommend! Thank you so much, and we are thrilled that you enjoyed your time in Kyoto and in Sakara as well! Please come visit again any time, we have a lot of repeat visitors who come to experience Kyoto in a variety of seasons. I certainly appreciate the time you took to comment on your positive experience. Take care and happy traveling in the future! Disappointed and would not rent this property again. To say I was disappointed with my experience staying at this property and dealing with who appeared to be the owner's agent is an understatement. The problem started when I noticed the comforter and pillows on both beds were not clean and seemed unsanitary. It had a permanent stench as if it had not been properly washed for quite some time after various renters had used the beds and bedding. The bathroom also smelled of urine, as if it had not been cleaned with the proper cleaning materials. It was obvious that both the bedding and bathroom were touched up with the most minimal amount of effort so that it appeared clean at first glance. But upon closer inspection and after having used the bed and bathroom, the insufficient cleanliness and unsanitariness of both quickly became apparent. I complained to the owner's agent, Yuko, after the first night of sleeping uncomfortably on the bed with the lingering unpleasant stench. Yuko called me at night while I was asleep, saying that she had just read my complaint email. I asked for clean pillows, sheets and comforters, and thought my problem would be solved by the third night of renting the room. Even though Yuko said she made sure she provided clean sheets, comforters and pillows by the third day of renting the property, the unpleasant stench still remained. Suffice it to say, the third night of sleeping was still uncomfortable with the lingering stench of unwashed and unsanitary bedding. At one point, Yuko mentioned that she would have to charge me for this "extra" cleaning. Her statement was ridiculous since a rental property that was fully paid for in advance (including presumably cleaning feeds) should have clean and sanitary bedding and bathroom in the first place. It is simply ludicrous that I had to ask for clean bedding because of a lingering stench that made sleeping uncomfortable. To add insult to injury, I ended up getting what appeared to be bed bugs after the third night of sleeping on dirty bedding. I had red marks and itches in the areas that were affected. When I complained to Yuko about the bed bug bites, she attempted to blame me for getting them. The long and short of it is that after it became clear I was dealing with an unprofessional person, I had to lodge a complaint directly with VRBO. I would recommend staying away from this rental if you care about sanitation, cleanliness and professional dealings pertaining to the rental property. Thank you for taking the time to write a review, and I would like to carefully address your points. Our guests' comfort is very important to us, and we take great pride in helping thousands of satisfied guests enjoy their time in Kyoto via our holiday accommodations. We have been in operation since 2005, so we have had a lot of experience in this field. I am certainly saddened when someone doesn't have a positive experience. I will start with the most important accusation: that there are bed bugs in Sakara. This is completely untrue - not only have we had the building tested, we also have the entire building detailed on a seasonal basis. If there were indeed some kind of bed bugs as you suggested, then we could have expected a couple of things: firstly, the satisfied guests that came immediately before and after you would not have been satisfied. Secondly, you would have mentioned something about bedbugs before staying for three nights, when in fact, the complaint came after you had checked out, and after a specific threat to our staff to write a poor review in lieu of a full refund. I can appreciate that you are very sensitive. I, too, am very sensitive to chemical odors, smoke, and animals. For that reason we use only the best natural cleaning products at Sakara, and the building was built using traditional wood, plasters, and other materials. It is an entirely non-smoking building. The bath room in the Sakara Bamboo Suite was updated and reinstalled with a modern 'unit' bath just three years ago, and our cleaning staff is professional and thorough. In this type of situation, we immediately do something to remedy the problem, which was done on this occasion. The pillows were changed, bathroom cleaned again, and everything double-checked. The sheets, towels and bedding at Sakara come from one of the most trusted and reliable companies in Kyoto which has been serving the hotel businesses of Kyoto for generations; 'Comfort'. If you or anyone else has a specific issue with the linens and towels that they provide, I'm sure that they would be happy to address your concerns. Our manager, Yuko, does not speak English as her first language, but we believe that she is incredibly attentive, professional, helpful, and friendly with customers, and we support her. Again, I am sorry that you were so unhappy staying at Sakara with your mother, but I assure you that our staff did their jobs to the best of their ability. Future guests, please contact us directly with Qs. Located right next to train station, yet was very quiet. Close to many shrines and very convenient to get around. We enjoyed staying here very much! The location is fantastic! Right near the subway station, making it so easy to get around the city. Plus, there’s plenty of food options nearby. The room was the perfect for two people,featuring a kitchen and laundry machine. The owners were incredibly helpful with making arrangements and suggestions. Truly a lovely experience. I would definitely stay at Sakara again! Thank you so much, and we are very happy that you enjoyed the accommodation and location. It's really our favorite area from which to explore Kyoto. We love sharing our knowledge and experience with guests, so that they can get the most out of their time in this beautiful city. Please come again and try out Kyoto in another season! Easy access to all the famous sightseeing spots; Heian Shrine, Maruyama Koen, Gion, etc. -- A wide variety of nearby restaurants -- Walking distance to the bustling downtown area -- Many shops, post office, banks, and grocery stores in the area. US dollar rate is approximate, based on current exchange rate. Please contact us to get more specific rate information. Rates per room depend on the number of guests and season.